Greetings from The 88 Project! We are bringing you news, analysis, and actions regarding human rights and civil society in Vietnam during the week of January 28-February 3. Imprisoned pro-democracy activist Ngo Hao had a stroke in prison, and his family wasn’t notified directly. Prisoners Nguyen Trung Truc and Nguyen Hong Nguyen have both been transferred to new prisons ahead of the Tet Holiday. And Le Anh Hung, a detained journalist awaiting trial, was denied a visit from his family this week. Authorities arrested three people in recent days, just ahead of the major holiday: Facebookers Duong Thi Lanh and Huynh Tri Tram, as well as Tran Van Quyen, who was allegedly arrested for ties to overseas pro-democracy group Viet Tan. This week, we remember Dr. Ho Van Hai, Vu Quang Thuan, Nguyen Van Dien, and Tran Hoang Phuc, four activists who were sentenced to 4, 8, 6.5, and 6 years in prison in two separate trials one year ago. Female activist Le My Hanh was summoned by authorities for questioning three times in one week. Former political prisoner Truong Duy Nhat is at risk, as he has been missing for over a week after fleeing from Vietnam to Thailand. Facebooker Dieu Hang (Selena Zen) is also missing this week. And security officers questioned university student Tran Ngoc Phuc this week about his online activities. In the most recent possible case of police brutality, people are responding to a video where a police officer is seen kicking a civilian. Under international advocacy efforts, members of the European Parliament sent a letter requesting that Vietnam release Hoang Duc Binh from prison, and Human Rights Watch has criticized Vietnam’s comments in its Universal Periodic Review. In the news, read about Vietnam-UK relations and an interview with exiled former political prisoner Dang Xuan Dieu. Please take action for political prisoners and activists who can’t be with their families during the Tet Holiday; consider donating to the Doan Ket Fund on their behalves. Imprisoned activist Ngo Hao, 75, had a stroke in prison, and the authorities failed to notify his family. His wife’s request to take him for treatment was denied. It’s been almost six years since the veteran and pro-democracy advocate was arrested for subversion. He is serving a 15-year sentence. The news actually came from fellow political prisoner Hoang Duc Binh. Hoa also had a stroke three years ago, and his health is worsening. He is unable to see out of one of his eyes, while the other’s vision is reduced by 40%. Nguyen Trung Truc was transferred from Quang Binh to Thanh Hoa Province. Truc may now be imprisoned at Detention Center 5, notorious for harsh treatment for political prisoners. The family was not notified in advance of the move. The sudden transfer comes as the Lunar New Year approaches, making it harder for his family to visit him. Truc, a member of the Brotherhood for Democracy, was sentenced to 12 years in prison in 2018. The authorities told Nguyen Hong Nguyen‘s family that he was transferred to prison Z30D, Ham Tan, Binh Thuan Province, but in fact he was transferred to Xuan Loc prison in Dong Nai Province. Nguyen’s family has been struggling since his June 2018 arrest, as he was the primary breadwinner. He was sentenced, without a defense counsel at trial, to two years in prison under the charge of “abusing democratic freedoms” for using his Facebook account to read/watch, post, and share content with “anti-state” messages. On the morning of January 29, Le Anh Hung’s mother and friend went to Detention Center No 2, Thuong Tin District, Ha Noi to visit him. However, for unknown reasons, the police forced Hung to wear a prisoner outfit and handcuffs for the visit. Hung protested this requirement. As a result, the prison authorities then banned him from meeting with his mom and friend. Hung was said to be in a good health, according to his lawyer, who had visited a few days prior. Hung, a journalist, has been in detention awaiting trial under Article 331 of the 2015 Criminal Code for posting a letter critical of the government and its proposed law on Special Economic Zones. He faces up to seven years in prison. Ms. Duong Thi Lanh (b. 1982), a Facebooker in Dak Nong Province, was arrested on January 30, 2019 when she went to the People’s Committee of Nhan Co commune, Dak R’Lap district under the summons of the Public Security “to work on matters related to 2 Facebook accounts called “Uyen Thuy” and “Mai Bui”.” Ms. Lanh’s husband, Tran Coi, confirmed with Radio Free Asia the information about the arrest, but said that Dak Nong Public Security did not give any documents to prove it. The Public Security searched her house with a search warrant, but did not provide an arrest order. According to Tran Coi, public security forces seized a number of assets including American soldier-style apparel and three phones, and announced that Ms. Lanh would be temporarily detained for three months in the Public Security of Dak Nong Province’s detention camp. In the last live-stream on SG Ngoc Lan’s Facebook account on January 27, 2019, Ms. Lanh said that she herself participated in the demonstration against the drafts laws on Special Economic Zones and Cybersecurity in June 2018 and was arrested along with 10 others on 11/6/2018 while sitting at the park in District 1, Ho Chi Minh City. She was fined 150,000 VND and released. Ms. Lanh denied that she was a member of the constitutional rights group Hien Phap. She also said that she had supported the provisional Vietnam National Government organization of Mr. Dao Minh Quan in 2017, but she no longer supports it. Mr. Tran Van Quyen (b. 1999), a native of Ha Tinh province, was arrested the Ministry of Public Security on January 23, 2019. Quyen’s brother said he was arrested while going to have coffee with friends in Di An, Binh Duong. After that, he was taken back to the house for a house search. The Public Security did not provide neither arrest order nor search warrant to the family. When Quyen’s family went to the detention center to send him food and clothes, they were only informed verbally by the investigators that Quyen was “arrested for participating in terrorist organization Viet Tan.” Quyen is currently detained in the B34 Detention Center of the Ministry of Public Security in Cu Chi. At 8:00 am on January 26, police arrested Facebooker Huynh Tri Tam at his private residence and brought him to the police station of Dong Nai Province. Tam, whose real name is Huynh Minh Tam, is an activist. His Facebook account, where he usually shares his concern regarding national issues, might be under authorities’ control since his arrest. This week, we remember Vu Quang Thuan, Nguyen Van Dien, and Tran Hoang Phuc, who on January 31, 2018, were sentenced to eight, 6.5, and six years in prison, respectively. Thuan and Dien, members of the National Movement to Revive Vietnam, were sentenced for making videos with alleged “anti-state” content, and Phuc, a 24-year-old student human rights leader, was sentenced for helping store and post some of the photos. We also remember Dr. Ho Van Hai. On February 1, 2018, in a secret trial, he was sentenced to four years in prison under Article 88 for posting online content and rallying support for an election boycott and protests following the 2016 Formosa environmental disaster. Former political prisoner Truong Duy Nhat has been missing since January 25, the day he attempted to claim asylum status in Thailand after fleeing Vietnam in the weeks prior. Nhat was arrested in 2013 in Vietnam and later sentenced to two years in prison for his blog, “Another Point of View,” which contained content critical of the government. His location remains unknown at the time of this writing. Facebooker Dieu Hang (a.k.a Selena Zen) has been missing since around 3 pm on Monday, January 28, 2019. The article “The Australian Government officially recognizes the Provisional President Juan Guaido” was the last post she shared before she went missing. Her Facebook account Selena Zen’s password was changed around 9:30 pm the same day. Dieu Hang is the owner of two Facebook accounts. A sharp commentator on Vietnamese politics, she frequently shares her views online that are critical of the regime. On February 1, security officers in Ben Tre Province questioned a university student, Tran Ngoc Phuc, for posting online content critical of the government and allegedly joining political groups on Facebook. Among the groups in question was “Liking BBC Vietnamese.” The case against Phuc is expected to continue and comes just a month after Vietnam’s new Law on Cybersecurity went into effect. Questions of police brutality are again brewing in Vietnam after a video surfaced showing a man being kicked by a police officer in Phu Yen Province. The man’s family says he was shoved to the ground after going to the police station for questioning; the officers contend the man was drunk and disorderly and that they had to subdue him. The officer in question is on leave, while an investigation is expected. However, the police have tried to rationalize the officer’s behavior in a way that some say is indicative of a larger pattern of behavior. In response to Vietnam’s Universal Periodic Review in front of the UN Human Rights Council in January, Human Rights Watch (HR) has said that “Vietnam presented a grossly inaccurate picture of its human rights record.” While publicly committing to the right to a defense counsel, HRW contends that in practice, many dissident defendants are represented by counsel that has little time to prepare for their case, and many trials are rushed. 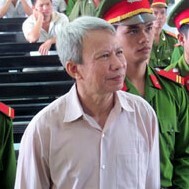 They also highlighted the case of Le Dinh Luong, an environmental activist and member of the Brotherhood for Democracy, who was denied the right to meet with his defense counsel (which is allowable under Vietnamese law for national security charges) until the month before his trial; he was later sentenced to 20 years in prison. As we approach the Tet Holiday, consider contributing to the Doan Ket Fund, a fund established by the NOW! Campaign to support political prisoners in Vietnam. Many prisoners and activists at risk will not be able to spend the holiday with their families this year. “Doan Ket” is Vietnamese for “solidarity.” All donations go directly and entirely to political prisoners and their families or to individuals identified by the NOW! Campaign as at risk of arrest, detention, and imprisonment.